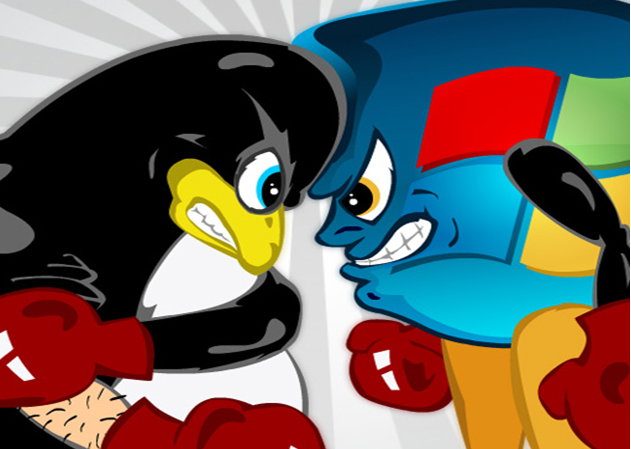 Hacker's Team: Linux and Windows : Who Better ? but Linux is more secure and less virus prone. · No Spyware: Not just spyware but none of those funny applications that keep doing things in the background. · Linux doesn’t need defragging: The Linux file systems work very efficiently such that it arranges data in a way that it doesn’t require defragging. · Linux doesn’t crash without any apparent reasons. In Linux the core operating system (kernel) is separate from the GUl (X-Window) from the applications (OpenOffice.org, etc). So even if the application crashes, the core operating system is not affected. In Windows (Microsoft prefers to call this tight integration) if the Browser crashes, it can take down the entire operating system. · Linux doesn’t crash if you accidentally pulled out your USB key/pen drive. Try this a 100 times if you don’t believe me. But don’t blame me if your pen drive data gets corrupt. · Linux doesn’t require frequent re-installation: In Windows if the OS crashes, there is no easy way to recover this. Many IT support staff doesn’t know what to do and all they can do is re-install Windows. Which means that users applications and preferences are lost, and needs to be installed again. I haven’t seen anyone using Linux, requiring re-installing unless there is a hard drive failure. Most things in Linux can be fixed without requiring re-installation. · Linux doesn’t require frequent rebooting: Linux runs extremely stable, even if an application crashes, there is no need to reboot the whole system, just restart that application or service. Linux also doesn’t require rebooting when a new hardware device is added configured. Linux doesn’t require rebooting when you change any setting or re-configure your Network or when you install a new application. · No licensing headaches: Yes Linux is free and you don’t know need to bother about the complexion licensing of per user/per PC/per server/etc. Note: Some Linux distributions charge a yearly subscription to get the updates and patches, however this is still simpler than the proprietary world. · 100 File Systems: Linux can read over a 100 different types of file systems. Windows is limited to its own two file systems. Well most general users may not care about this but its extremely useful is you are working in a mixed environment or you need to extract some data from a hard drive formatted on another computer. · Source Code: You have access to the source code and the right to modify or fix things if you are a programmer. Many end users think this is not necessary but they will realize how important this is when their application vendor decides to discontinue support on an older version to promote a newer one. · No Piracy: You can also share the software with your friends and its completely legal to do so. Didn’t your teacher tell you in kindergarten that you should share things with your friends? Linux and Open Source actually encourage that while if you do that in Windows its not only considered illegal but they will call you a pirate! · Linux costs less, because not only the OS is free but the applications are also free. Plus since Linux doesn’t have a virus problem, you also save on the recurring cost of Anti-Virus software. Note: You may still have to pay for support/training but the overall running cost is low. · Powerful Shell: Both Linux and Windows has shell environment Windows (know as command prompt). The shell environments in Linux (such as bash) are more powerful and you can write entire programs using the scripting language. This is extremely useful to automate repetitive tasks such as backup. · Portability: Linux can run from a CD or can be installed on the hard drive. Windows by default doesn’t have any such option. Using live CDs such as Ubuntu/Knoppix, users can try out Linux by booting from the CD, without the need to install the operating system. Linux is extremely portable, it can also run off usb pen drives/portable hardrives/thumb drives and more. · US government have Window Backdoors: Did you know that in Windows, there is built in back-door entry so US government can see you data as and when they like? Yes the US NSA has the key build into every copy of Windows. In Linux there is no such thing possible as the operating system is open source and can easily be detected and disabled. · Linux has built in virtualization (XEN/KVM/Virtual Box/etc.) so you can run multiple copies of Linux or Windows simultaneously. · Complete Driver Packages: The Linux kernel comes shipped with large number of hardware drivers. 3000 Printers, 1000 Digital Cameras and 200 webcams were supported by Ubuntu. On Windows, a lot of hardware doesn’t work until you install the driver, this problem is worse with Vista as Microsoft doesn’t allow drivers to be installed which are not supported/certified by Microsoft. On Linux, a huge percentage of today’s common hardware works perfectly out-of-the-box. · No registry Keys: Unlike Windows, Linux doesn’t use registry. Most of the configuration is stored in plain text files, which are easy to manage/backup and transfer between systems. Registry is a pain to manage, very complex and your system configuration is stored in a proprietary format which needs special tools to open. The biggest pain with registry is when it gets corrupted, this problem is eliminated in Linux because it doesn’t use registry. · Linux is the most documented operating systems and most of these documentations are available for free. These documents are well written and explain computing concepts too. · No more hardware upgrades: Linux runs happily on older hardware and the hardware requirements don’t increase with every new version. If you have really old computers like Pentium I/III, you can still convert them to thin clients using LTSP and still use them. If you compare the hardware requirements between Ubuntu and Windows, you would notice that Ubuntu’s hardware requirements haven’t changed for many versions. · Completely localized: As there is a strong community and the source code is available, Linux is localized into almost every language in the world. You can further customize it for your needs, you can easily do that. · Excellent package management: Linux has excellent package management tools which make it easy to install and upgrade applications, Most Linux distributions makes it very easy to upgrade from one version to another. · Excellent Development platform: If you are a developer, you will like Linux. Linux has all the development tools, libraries and compilers built in. If you are Java developer or a Web developer using PHP/Perl/Rub or doing C,C++ development, you will feel at home. · No Hidden APIs: Windows many hidden or undocumented APIs which is used for unfair advantage to Microsoft. In Linux all APIs are completely open and documented. For example Microsoft specifies that everyone writing Internet application should use the Winsock API while Microsoft Internet Explorer doesn’t use the Winsock API, it uses an undocumented API allowing Internet Explorer to run faster than other browsers. · No Execute by default: By default if you download any file, it doesn’t have the execute permission, making your system more secure. The app cannot execute unless you go and change the permissions. · No write access to applications: By default users cannot install applications unless they change their permission or login as a supervisor. This ensures that any virus or malicious code cannot go and write to your application folder. · No open ports: By default most Linux distributions have all their incoming ports blocked, thereby making their Operating more secure from network attacks. · Centralised repository of applications ensures that you are downloading your applications/patches only from a known source only. The repository is digitally signed which ensures that only the right application and code can be downloaded and installed on your computer. · Faster release cycle: Many Linux distributions have a fixed release cycle of 6 months which makes it easy for them to incorporate all the latest applications, bug fixes, improvement and support for newer hardware. Windows release cycle is not predictable. Takes a few years and is often delayed. · Multiple Interfaces: While both Linux and Windows have a GUI, Windows has only one default GUI. Linux is all about choice and has a option to use different type of GUIs or Window Managers as they are know as in Linux. Users can choose from something that looks like their favourite Operating System or they can choose something that’s simple and fast. Popular ones are Gnome and KDE. · Free Applications: Most Linux distributions come bundled with whole lot of applications such as Office Suite, Photo Editing, etc. You not only get the OS for free but you also don’t have to pay for the applications. Yes many of these open source applications such as OpenOffice.org also run on Windows but you need to find, download and install them where as there are available in most Linux distros by default. · Linux saves bandwidth cost: The volume of Updates that Windows, Antivirus and similar applications do, is much more as compared the updated in Linux. So if you are paying for every MB that you download, its a big consideration. · No automatic updates: Windows Vista it setup to automatically update your system by default. In Linux it will alert you for an update but you have to choice to click and apply the update. You can setup to automatic update if you like. So you can update when you like and not when your operating system decides to update. · Chat and Social Networking: Empathy/Kopete popular IM clients on Linux are single clients that can connect to all the protocols – Facbook Chat, Google Talk, Yahoo, MSN, Jabber, ICQ, AOL and more. Twitter/Facebook broadcast from the desktop. With Gwibber client, you can view your social network status right from your desktop or update your status to all your accounts without logging onto each of them separately. · Superb Graphics: Linux already has a usable 3D Desktop – Compiz. This makes it easy to switch and view multiple desktops simultaneously. It also adds a nice eye candy to Linux. If you still believe Linux is only for geeks, this feature will definitely change your mind. This doesn’t require you to purchase expensive graphic cards, it very comfortably works with on board graphic card. · No annoying message like Vista keeps telling you that xyz application is trying to access your system. Vista confuses the user, either the user will always click allow or don’t know what to do. · Easy to dual boot: Linux makes it easy for it to exist with any other operating system. If you install Linux on a system which already has Windows, Linux will not mess your Windows. Windows on the other hand messes up your Linux partition, if it finds one. · Linux has bundled Databases such as MySQL and PostgreSQL which are extremely powerful and used in production environments. Customer doesn’t need to purchase expensive databases. · Linux is been used for super computing clusters, most of top super computers in the World use Linux. Windows just can’t scale to that level. · File system scalability: while NTFS file system can scale up to 16TB, XFS on Linux can scale up to 18 million TB! Yes that bigger than what you would ever need. · Processor scalability: Linux can scale to unlimited processors. It is already running on a single system with 2048 CPUs. Windows can’t even claim to come anywhere near that number.